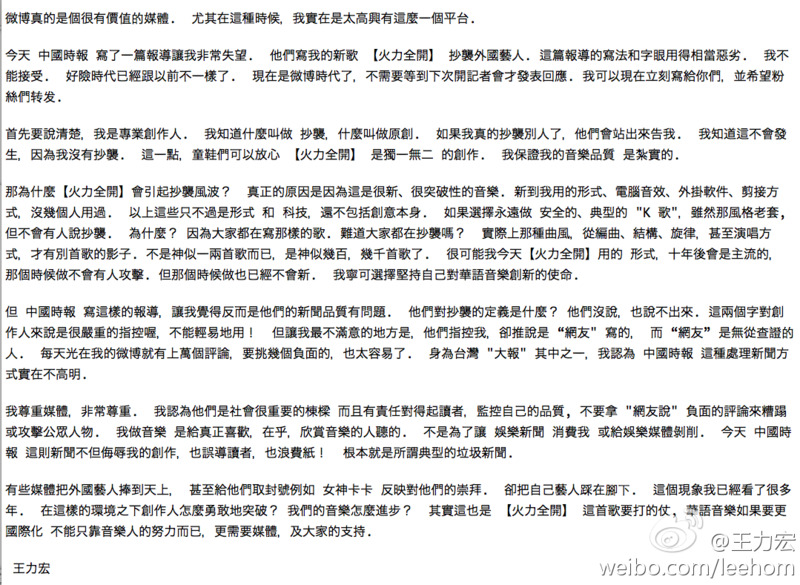 Leehom DID NOT Plagiarize !!! I know you will never give up. I believe in your music and your talent. And... I will support you forever. 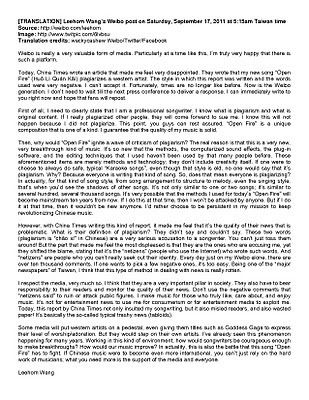 This is the real voice of Leehom that I love the most. Proudly Present Leehom's New MV "OPEN FIRE"
It's growing on me... finally. I love the video and I love the beat of the song. 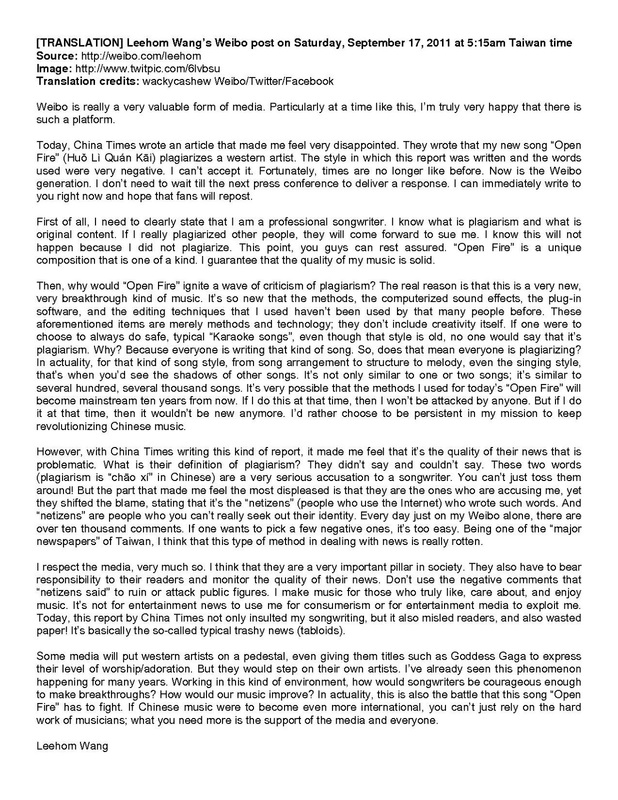 One issue, Leehom's voice sounds strange.. I love best when he used his thick voice like in "Noah"
although I personally think he still doesn't get enough credit. plus 2 new songs in this new album, OPEN FIRE. he may have to start his 28 songs from his UNBELIEVABLE. I really really cant tell which one should be out from the list. hmm.... hard hard choice. If I have to pick, it will be "NI HE WO" as Leehom barely sang it live. So that's my list. What's yours like? 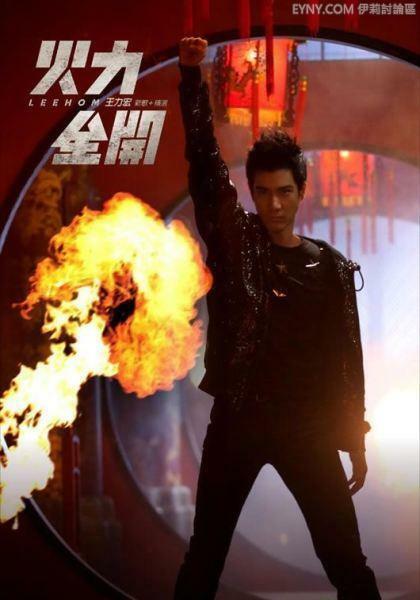 A true die die hard fan like me must have been expecting something not only extra-ordinary, but also extra-nice new songs coming from each of Leehom's new album. He's not like releasing album twice a year, - that would awesome, I'm not against it.. But he's not releasing it once a year either. So, I was always hoping that his album is something worth waiting for. Define that worth waiting for. Okay, that would be revealing the whole me worshiping his ballads, that's my first criteria. Then, it will have to come out with at least 20 new songs, haha! Third would be MV for each of the song, and ... last but not least, there are cute merchandises attached when we buy it. I was a bit slow this year on the whole Leehom's things. I didn't update my blog, I didn't browse, I didn't even know that he is releasing new album this year. I'm still a die die hard fan, don't try to argue on that. I have to admit. After listening to it more than 5x... it still didnt grow on me yet, except on that "waa...ai... ai.. ai... part". Some fans said it sounds like MJ's song.. no idea, really. I'm a bit lost with the new song.. so the next one better be ballad. Otherwise ........ nothing. I will still buy the album. hehe. oh..*this line was added after 8x listening and after 10min the post was uploaded* I think the MJ part is coming from that "ah and ugh" .... the very famous signature of MJ. I'll share my list on another post. * those who don't understand bahasa, "oneng" means "very dumb"